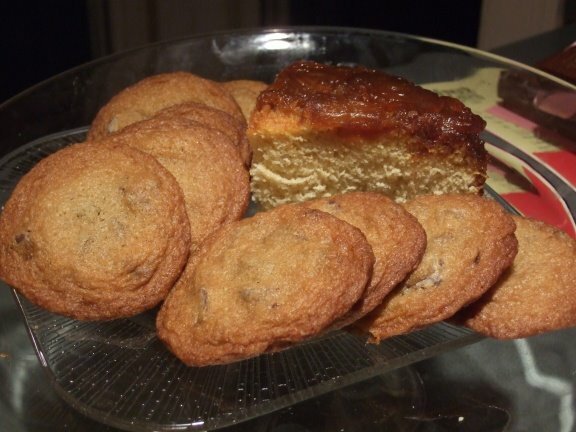 Chocolate chip cookies with their friend, Carmelized Pineapple Upside-down Cake. I’m posting this before heading off to the gym, the first day of a renewed effort to lose the last 15 — scratch that, 13.4 pounds — to reach my goal weight. I’m kicking up my exercise regimen in the hopes that it speeds up the process so I’ll be there before summer (though I’m conflicted about this & here’s why) while maintaining my need to eat sweets. Yes, it’s a need, not a desire. I crave sweets everyday, usually multiple times, and it’s a pull I can’t ignore. Sometimes a stick of gum or a cup of tea will sate things, but often I need something more substantial. Like a chocolate chip cookie. Studded with giant bits of dark chocolate, this crunchy little cookie is buttery with a salty hit; my favorite kind of chocolate chip cookie. Add a glass of milk, and I’m in heaven. Preheat the oven to 350-degrees F. Grease two cookie sheets or line them with parchment paper. In a large bowl, stir together the flour, baking soda, and salt; set aside. In another large bowl, cream the butter and sugars. Add the water and vanilla. Mix the ingredients until they are just combined. Add the eggs and mix them lightly. Stir in the flour mixture until just blended. Fold in the chocolate chips. Drop the cookies 2 inches apart onto the prepared cookie sheets using two tablespoons . Bake for 12 to 17 minutes or until the edges and centers are golden brown. Remove the cookies to a wire rack to cool. Yield: 4 1/2 dozen three-inch cookies.